The Installation Doctor LLC | COME SEE US AT OUR NEW LOCATION! The world is still spinning & so are we! We have another year ahead of us with great new products on the horizon. With so many new automotive accessories products coming to the marketplace yearly, most of us have no time to slow down for anything these days. That’s where we come into play. We are always on the hunt for the best automotive accessories products on the planet! WE WILL NOT CARRY IT IF OUR STAFF DOES NOT USE IT OR BELIEVE IN IT, PERIOD! So, check out what’s new in car audio from JVC, Pioneer, Kenwood, Sony, Rockford Fosgate, Infinity, Bazooka, Audiovox & Powerbass, just to name a few. Also, check out what’s new in auto & truck accessories products from BakFlip, Undercover, Extang, Putco, E&G Classic and of course, Custom Wheels & Tires. 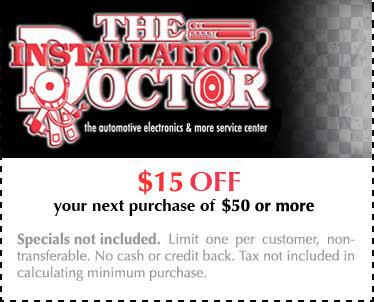 We truly offer our friends/customers a complete automotive accessories package like no other! We want you to feel right at home when leaving your vehicle(s) with us. We take extreme pride in what we do here every single day! As always, we do our very best to make your experience here quicker & more convenient. Unlike most retailers, we absolutely love our online shoppers! If you’re a huge online shopper, then you’ll be right at home here! So, if you shop on CrutchField.com, Amazon.com, Ebay.com or any other online retailer for your car audio/video gear or you’ve already purchased Auto/Truck Accessories that need installed, we’ve got you covered! We absolutely love installing this stuff so you don’t have to! It has truly been a pleasure these past years serving friends just like yourself! This entry was posted in From the Management, News. Bookmark the permalink. Want more DETAILS on our Specials? Give us a call @ 717-718-9808. $15 OFF ANYTHING PURCHASED AT $50 OR MORE. DOES NOT INCLUDE SPECIALS LISTED ABOVE. Click here for a printable coupon.